Spring cleaning, spring cleaning, spring cleaning. I love this time of year! I am truly in my happy place when I am cleaning and organizing. I used to wonder what that says about me, but I have learned to just embrace it. We all have our indulgences, right? It can be overwhelming enough to just go through your stuff and make a pile of things to purge. Never mind what to do with the stuff from there. By the time I get to that point – I am usually pretty tired out. As you are cleaning out your closets, drawers and cabinets, here are some options for getting rid of your clutter. Trash Gasp! In our green-minded world, it seems like mentioning throwing things out is taboo. Honestly, if the item in question is broken, missing pieces, hopelessly stained or torn and really of no use to anyone, just do everyone a favor and throw it away. It is burdensome to dump those things onto a charity. Recycle Certain items should not go into the trash. Examples are batteries, electronics and certain household chemicals. Check with your city or county to see when their spring recycling day is (our city does one in the spring and one in the fall) and/or if they take hazardous materials at a facility during other times. Our county offers a service through a local recycling facility that is free if we show our ID proving we live in the county. Best Buy will take defunct electronics for free (up to 3 per household per day) and Gazelle.com will take your old iPhone – and maybe even give you money for it! If you are stumped, try Earth911 for more recycling resources. Sell Selling does take some work, but you can make some money from your stuff. If you are not motivated to sell everything, then consider just selling the bigger ticket items and donating the rest. Craigslist The listing price is right (free) and you don’t have to ship anything. Choose a public meeting place and use the appropriate caution. Save your listing email, so you can delete the listing once your item has sold. Including an accurate description and photo can narrow down the truly interested buyers. Search for similar items to get an idea of what you can reasonably charge. Ebay or Amazon These sites offer what Craigslist cannot always offer – a wider audience. If you have something unusual to unload, it can be hard to find the right buyer. Do a search of like items and be careful to list your item under the correct category and be honest in your description. Amazon lets your item be on sale indefinitely, Ebay has a closed end date which you choose. Be sure to check the shipping policies and be careful on shipping prices – they can be higher than you think. Another option is to bring your stuff to an Ebay seller, who will take a commission to sell your good for you. Garage Sale Did I just hear you groan? Oh, no, I guess that was me. Garage sales can be A LOT of work. Still, if you have a lot to purge, it can be a good way to go. Consider it penance for owning so much stuff – it is a solid motivator to buy less in the future, too. 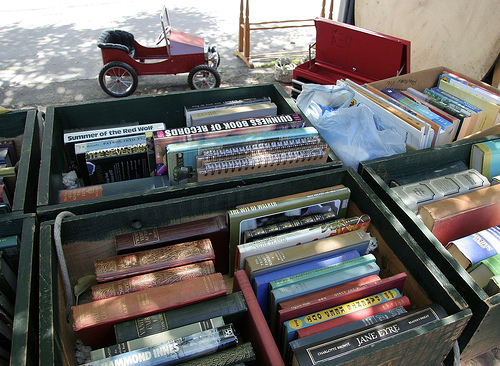 Check out these tips for a successful garage sale if you are planning a sale. Consignment I have not personally gone this route often, but there are consignment shops for just about everything from toys to clothes to furniture. Search for locations in your area to learn more and follow these tips for selling consignment. Donate Let’s face it – donating is easier than selling. In certain cases, you can recoup some money by itemizing each donation on your tax return as a charitable donation. In order to do so, you need to have a list of what you donated, a photo of the pile of donations is recommended, and a receipt from the organization. Usually the receipt is just on their standard form with the donation date on it – they will not itemize your donations for you. Follow the IRS guidelines for deducting charitable donations. Be sure to check the websites for a list of items they will take and note what they will not take. Friends or Family Do you know someone who has younger kids that you that could benefit from some gently used clothing, toys or books? Or someone who may love that cast off vase or old-to-you curtains? How about those books? Sharing these items with someone could be more of a blessing that you would ever know. Do try to think of whether a person could really use the item and be respectful if they decline. Please note that items passed along this way do not qualify as a tax donation. Goodwill It is tough to beat the convenience of donating at the Goodwill. Just drive up to the drop off zone, wait for an attendant and unload your stuff. You can get a receipt for your tax records and move on with your life. Done. Pick-up Some organizations will pick up your donation right at your driveway. Two national organizations are Vietnam Veterans of America and the Lupus Foundation. Go to those sites to enter your address and select a pick up date from the available times they will be in your area. Clearly mark your bags or boxes with the organization’s name, so it is not confused with the trash. Freecycle. Freecycle is not a charitable organization, so no tax write off, but it is a good way to keep something that really does not have a ton of value or is not accepted by donation sites out of the trash, as long as is still usable for someone. You simply list your item up for grabs and wait for a response asking for the item. The person picks it up and takes it off your hands. Each area has their own ‘group’- go to the site and see if there is a group in your area. Church Our church has a couple of silent auctions during the year for various events (preschool, men’s ministry). We have donated items that have a good value but are hard to move any other way – hunting knives, large art prints. Your item will be tax deductible, as long as you get a receipt, take a photo and do not receive goods or services for your donation. Happy Spring Cleaning! May your stuff find a good home. Amazon Trade-In: mail certain items free to Amazon, and they will give you a small credit in your account. No need to mess with pricing and selling things — plus you get rid of them faster! Consignment sales, rather than consignment shops. The big one is Just Between Friends (jbfsales.com); I like these because it’s a one-time shot — spring and fall — and whatever doesn’t sell, you can choose to donate at the end of the sale. You do get the tax credit and, again, you get rid of the stuff without it coming back to your house/continuing to take up room! You’re right, Joanna! Amazon Trade-in is pretty easy to use – easier than eBay, that’s for sure. I’ve heard really good things about the Just Between Friends sales, but haven’t gotten to participate in one. Will have to check that out. Ditto on the consignment sales. A little Googling will let you know when the next one is in your area–often, there are highly local sales. My friends who have tried consignment shops have had very mixed luck, to the point that I get more from the deduction through donating, because the terms are very rough around here.